Monday, July 30, 2018 Enjoy the same strategic game, albeit with brand-new and absolutely gorgeous aesthetics! This is eye candy for all train lovers! 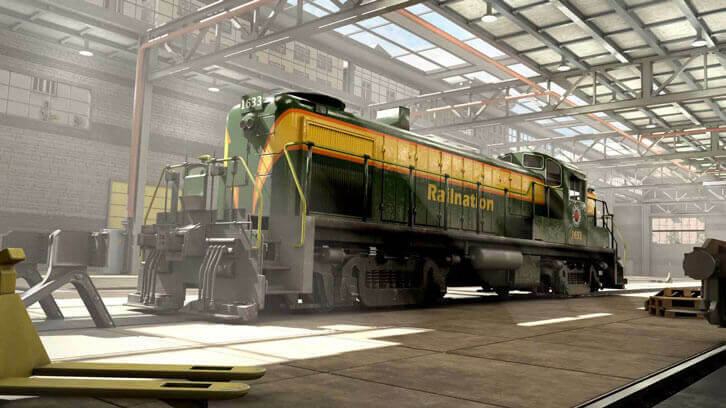 Over recent months the Rail Nation's 3D artists have done a great job completely overhauling the engine purchase screen. Trains and engines now shine in a brand-new light. Each of the six eras now has its own look matching its period. Just like the eras, trains and cities, the engine purchase screen now evolves from a steam-filled engine house to a well-lit hall with a glass roof. By changing the proportions, the difference in engine sizes is now even more realistic. The update 4.8.0 is being rolled out to all Rail Nations servers right now. Take a look and enjoy the new home of the trains.